In the last 5 years, video demands have tripled in the event production industry. From playback of slideshows to large format image magnification, the need for video imaging is a part of seemingly every event! FP Logistics offers a wide variety of video and display equipment to make your productions go! Projectors: Video projection is one of the fastest growing market segments in the event production industry. 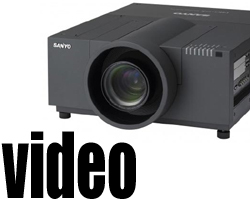 While there is a vast variety of different projectors with various features, at FP Logistics, you'll find a wide selection of video projectors for rental! Displays: With visual media content seemingly needed at every event, video displays are an excellent choice. At FP Logistics, you'll find a wide selection of video displays for all your rental needs! Screens: Video screens come in a variety of sizes and formats. You can find a wide selection of screens for rental at FP Logistics! Mixers and Switchers: Having the right video mixer or switcher means all the difference in the world when it comes to completing your video project. At FP Logistics, you'll find a wide variety of video mixers and switchers for all your rental needs! Accessories: Having all the right video accessories is an absolute must when you're trying to put together a video project efficiently! At FP Logistics, you'll find a wide variety of video accessories for all your rental needs!